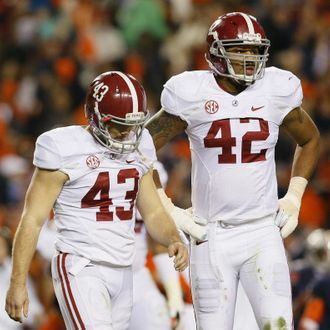 Alabama kicker Cade Foster had a rough night during the Iron Bowl, missing three field-goal attempts and getting benched in favor of a freshman whose potentially game-winning kick fell short (then got returned for an Auburn touchdown). This led to death threats and various other abuse for the senior, whose team stuck up for him but who all the same must have been feeling pretty low. But then he got some support from an unexpected quarter: According to Foster’s Instagram, former President George W. Bush sent him a note of support on official stationary. It says: “Dear Cade (#43), Life has its setbacks. I know! However, you will be a stronger human with time. I wish you all the best – Sincerely – another 43 George Bush.” How nice! Foster says he’s framing it. Let’s hope this one isn’t a hoax.